Tried and tested workplace staple that combines exceptional durability with great attention to detail. 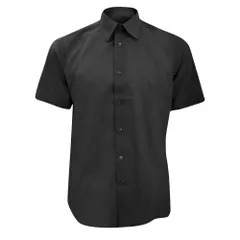 High quality Oxford fabric with excellent finish. Contemporary, tailored fit with stiffened semi-cutaway boned collar. Double turnback hem on sleeves. A reliable, tried and tested choice, the benchmark in its category. Size: Neck (ins) 14.5, Chest To Fit (ins) 36-38. Neck (ins) 15, Chest To Fit (ins) 36-38. Neck (ins) 15.5, Chest To Fit (ins) 38-40. Neck (ins) 16, Chest To Fit (ins) 40-42. Neck (ins) 16.5, Chest To Fit (ins) 40-42. Neck (ins) 17, Chest To Fit (ins) 42-44. Neck (ins) 17.5, Chest To Fit (ins) 42-44. Neck (ins) 18, Chest To Fit (ins) 44-46. Neck (ins) 18.5, Chest To Fit (ins) 46-48. Neck (ins) 19, Chest To Fit (ins) 46-48. Neck (ins) 19.5, Chest To Fit (ins) 48-50.